This is not our apartment, but it reminded me of it. 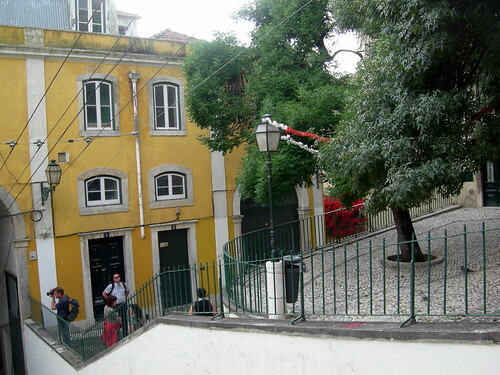 Ladies and gentlemen, we have a place to stay in Lisbon! Yes, indeed – we have now officially booked our first lodgings for the Europe trip, and with 10 full days to spare. We now have a place to go to straight from the airport; a place to decompress and de-jet lag; a place for me to do my first European round of steroids. Hooray! We are all about logistics here right now. We need to file our taxes before we go, of course, so I broke out the ol’ Turbo Tax this evening. We’re reviewing our to-do list constantly, trying to divide the tasks up between the few days we have left. Our goal is to be done with time to spare so that we can relax and be calm when it is time to go. Considering that I generally pack for trips the night before, accomplishing that will be a minor miracle, but it is a good target to shoot for. I’m grateful! that even though I felt horrible at work all day, it wasn’t any worse; I got home to discover I had forgotten to take my medications this morning. Yikes! I’m lighter! by a big pile o’ stuff in the office. David just walked into the room and said, “The upstairs is starting to look clean!” Now that is a major miracle. I was up above it; now I’m down in it.